When the master of a lodge is invited to continue in the chair for an additional year, the subsequent proclamation ceremony can sometimes lack lustre and zip. Pictured from left to right, are: Harry Cox, Craig Scott and Robert Marsden. The apparent simplicity of an abbreviated ceremony oftentimes results in a rather meagre or even disjointed programme. But there were no such discrepancies at the proclamation ceremony of Rectitude Lodge of Blackpool No 4122 when Robert Marsden remained in the chair for a further year. Lustre was in abundance and it was bursting at the seams with zip. That the ceremony was so vibrant would not be a revelation to those who know the lodge members. 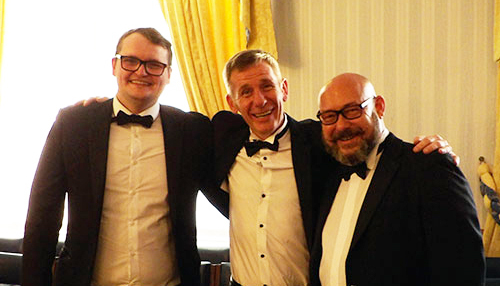 Even to the casual observer, Rectitude Lodge of Blackpool has a firm core of young, enthusiastic Masons with a well-defined sense of teamwork and camaraderie. They are chummy, chatty and cheery. The lodge was consecrated in November 1920 when a similar solidarity prevailed within its membership. The Great War had ended and friendships were cemented and strong. 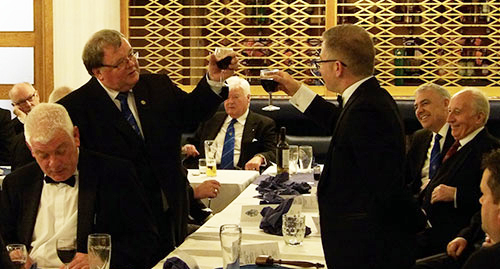 One can imagine that the founder members were similarly chummy, chatty and cheery and, in the run-up to the lodge’s centennial celebrations, that bond of friendship is equally pronounced. An effervescent young Mason, Robert Marsden and the officers of the lodge kicked off the meeting with a faultless opening, discharge of the general business and progression to the second and third degrees in preparation for the entrance of the principal guest and his retinue. The ritual was disciplined, precise and crisp. Those familiar with the lodge’s director of ceremonies Terry Barlow would not be surprised at the exactness of the workings. Terry is an experienced director of ceremonies with perfection firmly stamped on his DNA. Attention to detail is his trademark. The working tools trio. Pictured from left to right, are: Michael Sjollema, James Wilkes and Neil Callaghan. And it was with the same efficiency and deliberateness that he retired from the lodge to announce the arrival of Assistant Provincial Grand Master Harry Cox, Past Assistant Provincial Grand Master Terry Hudson and Chairman of Blackpool Group John Turpin, accompanied by acting Provincial grand officers Joe Codling, Jim Finnegan and Philip Houldsworth. Following the customary offering of the master’s gavel to Harry, and his gracious rejection of it, and the standard salutations to grand and Provincial grand officers, the main item on the agenda got underway. The installing officers were requested to take their respective posts and the responsibilities expected of them could not have been in more capable hands. 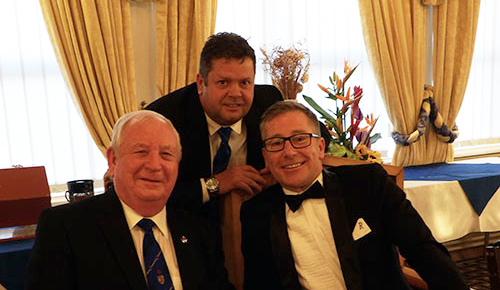 John Fadden was duly escorted to the senior warden’s chair, Rick Clarke to that of the junior warden and Sammy Roy took up his position as inner guard. Safely planted at their posts, Craig Scott proceeded to proclaim Robert as master of the lodge for the ensuing year. Determined to make the occasion both memorable and rewarding for Robert, Craig performed the well-structured ritual in a genuine and reverent manner. Robert, on his part, appeared to be enjoying the ceremony as much as he had done 12 months previously. Being master of the lodge obviously sits comfortably for him. The ‘light blue’ officers of the lodge. 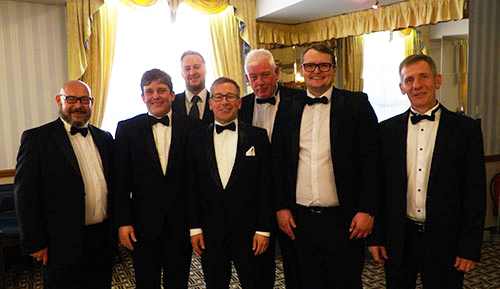 Pictured from left to right, are: Neil Callaghan, Justin Burgoyne, John-Paul Lovie, Robert Marsden, Dave Cryer, Michael Sjollema and James Wilkes. When Craig had completed the proclamation, there followed a spree of equally excellent ritual, beginning with a trio of junior brethren explaining and applying the working tools of each degree. Michael Sjollema came out on the floor first. He stiffened the sinews and summoned up the blood to project an exemplary explanation of the working tools of a master Mason. James Wilkes was next to impress the dignitaries with his sparkling recital of the tools of a fellow craft and finally, Neil Callaghan approached the pedestal to deliver the tools of an entered apprentice. Showing calm repose, the young ‘light blue’ approached the master and what emerged was a masterpiece of ritual. Mentally at his brightest, he delivered the working tools with the ease and confidence of a seasoned pro. The high standard of ritual was maintained throughout the remainder of the ceremony and investiture of officers. The installing wardens and inner guard demonstrated their credentials with perfect orations, as did group chairman John Turpin and William Rigby with theirs to the charity steward and deacons respectively. John-Paul Lovie, a good friend of Robert Marsden and a young Mason who has established himself as a first-rate ritualist, provided a passionate and sincere address to the master, revealing why he has been appointed director of ceremonies for the lodge, following Terry Barlow’s decision to retire to the less conspicuous role of treasurer. Blackpool Group Vice Chairman David Cook proved his worth with a delightfully animated word-perfect address to the wardens. There only remained Harry Cox’s address to the brethren of the lodge to complete the proclamation ceremony. One of the thoughtful members of the fraternity had once said: “The wonderful thing about Harry is that in performing ritual, he makes it sound as if it is straight off the cuff and specific to that one occasion.” It was with that degree of genuineness and geniality that Harry performed on this occasion. It was an ideal completion of the formal element of the proclamation. Harry Waggett (left) toasts the master Robert Marsden in song. Craig, in announcing the conclusion was instantly relieved and a short expulsion of breath confirmed his relief. It was, of course, a cue for Harry to rise from his seat and convey the greetings of the Provincial Grand Master Tony Harrison, a task he carried out with fervour and eagerness. He wasted no time in congratulating Craig and the proclamation team for the quality of the ritual and drew particular attention to the three young Masons who had presented the working tools. He was also keen to level his praise on director of ceremonies Terry Barlow, commenting that such quality of ritual can only occur where a director of ceremonies has successfully stimulated, encouraged and cajoled his team. As one might expect of a master who is remaining in the chair for an additional year, Robert sat confidently and at ease while all those around sweated and toiled through the ritual. He was savouring each moment as if it were a new experience for him. His confidence was boosted still further when the details of charitable disbursements were disclosed to the proletariat. He knew that it was an impressive total. Rectitude Lodge of Blackpool has a body of young Masons who work hard at raising money for charity. Dave Cryer, in particular, is ceaseless in his fund-raising activities. John Turpin (left) enjoying Harry Cox’s jokes while John-Paul Lovie shares the fun in the background. Having read the details to the gathered throng, Harry was full of praise for the efforts of the lodge members: £2,944 to Brian House; £200 to Positive Youth Trust; £200 to Blackpool Carers Centre; £315 to Great Eccleston and District Friends of Cancer Research and £100 to the Blackpool Masonic Building Fund; a grand total of £3,759. Little wonder that Harry and the gathering were full of praise! And little wonder that it was with glowing hearts that they retired to the festive banquet. In the dining suite there was a general joie de vivre, a perfectly chirpy mood at the serving of the prawn cocktail that grew to a boisterous joviality by the time the cheese board arrived. All were in festive mood and ready for a fun time. Getting into the spirit of the occasion, Harry was sporting genial banter with the crowd during his response to the toast to the grand officers. There were some serious messages in his words but the party spirit ensured that fun and laughter were the major ingredients. Each of the speeches were in a similar vein and Harry Waggett seemed even more cheerful than usual when he sang the master’s song. It was one of those evenings. It was full of fun and with Robert in the master’s chair, it looks like the lodge is in for another fun year. Pictured from left to right, are: Joe Codling, Jim Finnegan, David Cook, Terry Hudson, Harry Cox, Robert Marsden, Craig Scott, John Turpin, Philip Houldsworth, Terry Barlow and Bob McGown.